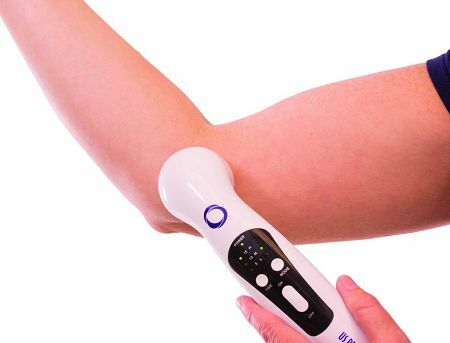 The US Pro 2000® 2nd Edition is a clinical grade therapeutic ultrasound device that helps with effective pain relief. The pulsed sound waves travel deep into the tissue and induce vasodilation, which helps increase blood flow to the treated area and is found to help relieve pain and reduce muscle spasms. It comes uniquely equipped with a soundhead pre-warming feature on an ergonomically designed sound head for increased patient comfort. Before starting therapy the soundhead preheats so that it's more comfortable and warm. Once therapy is engaged, the pre-warming feature turns off to allow for the most effective treatment. With three output intensities, and three treatment time selections, the US Pro 2000® 2nd Edition can provide a wide range of therapy treatments. The aluminum sound head is watertight for use in underwater therapy (for 30 minutes), though only the metal portion is watertight - you can not submerge the entire sound head. This new and improved portable therapeutic ultrasound unit is a great choice for non-invasive pain relief. No more pain meds or pills, this unit is very similar to the one used in your Chiropractor's or Physical Therapist's office. ***Note: Portable Ultrasound may only be returned if the product has NOT been used. Used Ultrasound devices may not be returned due to sanitary health reasons set by the FDA. If you are attempting to return the device due to defect or malfunction with performance, this would go through the warranty and we ask you to please contact us for a warranty claim. As a licensed PT Assistant I have used Ultrasound machines for over 20 years. This is easy to use and portable. I am using this at home for some muscular issues for my family and it has been useful. Although, I wish it had a modulating setting. Please make sure to use under a professionals guidance. This device appears to work very well on reducing pain & inflammation on recent or ongoing (chronic)injuries. For example, I'm having my left knee replaced one week from now. I began using the ultrasound some months before, and it improved my condition so much that I began to question if I had been a hypochondriac with my knee problems, and so I started riding bike again after about a year of being unable to ride at all. After a couple months and many 20 mile rides, it became obvious that my knee really was bone on bone after all, and there was no alternative to a knee replacement. That just shows, I think, that this device is clearly remarkable in its ability to reduce pain & inflammation and allow one to resume a rather normal life. It can't, however, cure a worn out joint, but it's really effective at helping you get by with one I highly recommend it. Love this model compared to the 1000 I bought couple yrs ago,Its almost as powerful, as our large clinic model,head heats up, had timer ,,goes off when head is lifted. 10 xs better than last model, and having a recent nerve irritation injury,in my wrist, the head fits better than the larger model, ,very portable, to take home. Im very happy.with it. Purchased this for my wife's shoulder pain, I ended up using it for my knee pain. It worked very well, after a couple of 5-minute treatments the pain eased up a lot. I was also attached by a lot of mosquitos. I put on some gel and used the pro on and around the bites, the swelling went down right away and the itchING stopped. Purchased and been using it for about a month now. I have used the unit on all 3 settings and noticed a physiological change in the area I use it on. You have to keep it motion as when you leave it in a spot for a short period of time, the area begins to feel like when you hit your funny bone. It definitely floods the area with blood but repair is done in conjunction with your diet. I supplement with Collagen and Glucosamine. Very pleased with this unit. When compared with other portable models, this one has true therapeutic benefits/settings for pulsed (non thermal)/continuous (thermal). I haven't used this unit as much as I expected but it is a very nice unit, well made and apparently as effective as much more expensive units. The original unit could have had a bit more gel as the small bottle hardly lasted long, so if you are ordering one, order an extra bottle or two of gel. Learn how to use the unit as there are different depth settings. This portable ultrasound machine is everything that I read in previous reviews, and I have been recommending it to many of my friends lately. It is unbelievably compact, warms up quickly, and does a great job of relaxing my knotted muscles and of getting the blood flowing again. Because it has a 1.0 MHZ acoustic frequency, it is the same strength of the machines at PT and chiropractic practices, which is important to me. I bought it because I was having a problem with my shoulder, and now I am using it for hip flexor muscle spasms. Whereas it does not cure my problems, it definitely makes me more comfortable without taking any medications, which could have bad side effects. Machine worked real well is helping me heal my achilles tendon, I used every evening when I was sore and it took the soreness away, highly recommend for the money great deal. I bought this item for my husband and he loves it. It is very easy to use and works excellently. Works great my physical therapist recommended it. My husband and I both feel it works as well as the one our physical therapist and our chiropractor use on us. This product really helped me with my client's pain management. I do recommend this for anyone in the health field to use. Just what I was looking for - small, portable and effective. I bought this product in April. I've been using it. It helps to reduce the muscle pain. I'll recommend this product. Excellent quality, works just as expected! Great product! Works well, just like in the physical therapy ! Q: Can this ultrasound be used without the heat? Yes, the US Pro 2000 can indeed be used without the heating function. Q: What is the difference between the US 1000 and the US Pro 2000? The US Pro 2000 is about 3x more powerful, operates at a 100% duty cycle on the High mode, resulting in a Continuous Pulse, which is preferred by most therapists, and also features a pre-warming sound head to allow for extra comfort so that the patient does not have to apply a cold aluminum sound head directly to the skin. Q: The device has ac/dc does that mean it can operate with batteries? It does not say so on the video or on the specifications. The US Pro 2000 runs only on the AC Adapter, meaning you have to plug it in to a standard wall socket. It does not run on individual batteries. Q: is it possible to use this without the pre heat option? Yes! The US Pro 2000 2nd Edition CAN be used without the preheat function. If you do not want to wait for the soundhead to preheat, you can press both the MODE button and the TIME button simultaneously. This will cause the device to go back to Standby mode, and bypass the preheat function. Q: Can this ultra sound hear the heart beat? Our portable ultrasound devices are designed for therapeutic ultrasound, not ultrasound used for sonography, or imaging. Therapeutic ultrasound is used for stimulating blood flow and speeding up the healing process for soft tissue injuries. It is also great for relieving pain from swelling, as well as gently massaging muscles, tendons, and ligaments. Unfortunately, we do not have any sort of guide available that shows recommended treatment settings for different body parts using therapeutic ultrasound. Ultrasound is certainly a doctor-approved treatment option for a large number of ailments, though. For specific cases, we highly recommend consulting with a doctor/medical professional to advise you of the optimal treatment settings for your particular situation, as we do not staff medical professionals, but we do know the ins and outs of the products that we carry. Was this answer helpful? 10 of 15 Customer(s) found this Answer helpful. Q: is the equipment 240 volts? Yes, the US Pro 2000 comes with an Adapter that takes 100-240V. Q: Is this unit safe to use in water instead of ultrasound gel for uneven small surfaces like fingers and elbows? Yes, the US Pro 2000 can be used for aqua therapy, however the soundhead can only come in contact with the very surface of the water and can not be submerged too far. We highly recommend first consulting with your doctor/medical professional prior to use for proper instruction based on your particular case. Q: How much rest time should be given to the device between two treatments?And how many treatments can be done at the maximum in one day? Please consult with your doctor for specific treatment settings and questions regarding your particular case. Was this answer helpful? 8 of 23 Customer(s) found this Answer helpful. Q: Is this good for pain and for relieving inflamation and for scar tissue after surgery? Therapeutic ultrasound can certainly be used for those purposes, but it is always recommended to first consult with a doctor to see if ultrasound is a good fit for your particular case. Q: What does your 1 year warranty cover? If within the 1 year period, you ever feel there is something wrong with your device, if you need any assistance at all, please let us know and we will do anything we can to assist on our end. If necessary, we will file a tech support/warranty claim with the manufacturer so that their Technical Customer Service Rep can reach out to you to walk you through the item, go through any pertinent troubleshooting steps, and then go from there. Should your item be deemed faulty or defective, then they can issue a replacement device or a credit for the cost of the item. Please refer to the troubleshooting section in your Instruction Manual, along with the manufacturer's demo videos on this product page, as a first step for any questions. 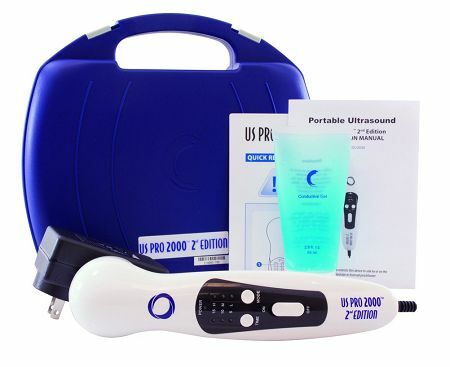 The US Pro 2000 is an ultrasound therapy device for pain management, operating at a 1 MHz frequency. It would not be recommended to use for cosmetic purposes, as the sound wave penetration may be too deep for facial tissue. Consult with a doctor first to see if this would be right for you. Q: Can this system be used for healing liposuction sites (after surgery)? This would be a question better directed towards a doctor/trained medical professional. We can only provide more technical sort of information as it relates to the items we carry. Please refer to the "Function Test Of Ultrasonic Action" (Water Droplet Test), as indicated on Page 1 of the Quick Reference Guide that comes with the device. Was this answer helpful? 1 of 6 Customer(s) found this Answer helpful. Q: Is this safe to use with Lymphoma patients? Any studies on the negative effects of this type of Ultrasound on cancer? Thank you. This would be a question better directed towards a doctor/trained medical professional, as we do not staff any doctors here. We can only provide more technical sort of information as it relates to the items that we carry. Feel free to take a closer look at the US Pro 2000, which is arguably the most popular therapeutic ultrasound device for portable at-home use, if your doctor says ultrasound may be a good fit for your particular case. We will be happy to help if you have any questions beyond that point. Q: how much do your units weigh? According to the official product description here, 0.43 lbs (without the adapter). Q: I have been having jaw muscle pains. Can this device be used on the jaw and around the face? The 1MHz frequency of the ultrasound output may be too intense for thinner and more sensitive tissue, such as around the face... It is always best to consult with a doctor/trained medical professional first to see whether a form of therapy like ultrasound would be recommended for any particular case.